Well I think this news deserves a thread of it's own, so that more can find out. Shunkan Sentimental release date 2/3/2010! 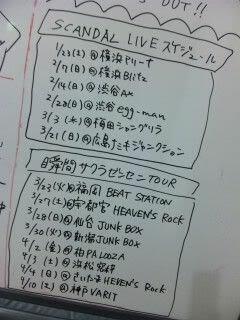 And a spring national tour "SCANDAL ~Shunkan Sakura Zensen* TOUR~Spring 2010"
The places have also been decided! MBS and TBS TV station's FULLMETAL ALCHEMIST's ending theme has been decided as the new song "Shunkan Sentimental." Its release date will be 2/3/2010. They will carry this song with the decision of a spring national tour. 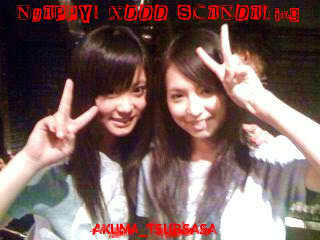 "SCANDAL ~Shunkan Sakura Zensen TOUR~Spring 2010"
omggggggg. I went to this city. @_@ Someone kill me. Please. Ticket fee: Standing and watching the performance (Reference number dated) 3,500 Yen tax included. Drinks are separate. I. Do. Want. To. Go. *Sakura Zensen means Cherry Blossom Front, so literally, it's SCANDAL ~Cherry Blossom Front Moment~TOUR Spring 2010. Again, thank you Fujiko for this translation. Seems like they will be really busy this year eh. Go go SCANDAL!!! We have here again, may I say ridiculous prices for tickets? Well, the cost of living in Nihon is really high. O_O its during March and May, SPRING. If I'm not mistaken, I see 16:00/17:00 START and END respectively? Why can they only perform for 30 minutes? konohagure wrote: We have here again, may I say ridiculous prices for tickets? Well, the cost of living in Nihon is really high. 30minutes? um...I don't think so. Take "OPEN16:30/START17:00". for example, this means that the door opens at 16:30 and the show starts at 17:00. Their show lasts about 100~120miutes, so the end of the show will be at about 19:00. Remenber this is their headliner(one-man)tour, they play about 15 songs. Yeah, they can only perform 4-5 songs with 30 minutes. 30 minutes ain't bad at all but ugh, its like a cliffhanger for me. This will be another good exposure for SCANDAL. Thanks for the blog pic mc~. Yep,they're having a Shunkan tour,and some lives. As you all can see. Taken from Rina's blog post. yes....^V^,suuuuuggggggggoooooiiiiii...kekeke, at last a Shunkan tour! I think that's referring to the Spring tour eh? From January all the way to April.Spread out,of course. Hope there will be some live performances videos! Hahaha my bad, I didn't payed attention to the lives above. I need some sleep. I would love to go too!!!! Morelemmings wrote: I would love to go too!!!! Yesterday was the first one eh. mc~ wrote: Yesterday was the first one eh. I heard that was a pretty short appearance on the 2nd stage(sub-stage) of Ontama Carnival 2010 held at Yokohama Arena. Also, I heard many said Shunkan Sentimental ROCKED on the stage! !